Angelina Jolie always plays the role of kind, intelligent and positive characters in films like Christine Collins in Changeling, Evelyn Salt in Salt, Jane Smith in Mr. & Mrs. Smith, etc. But the 2014 Disney movie Maleficent, Angelina Jolie changes the positive image of the past, starring the negative role-an evil witch. Wow, hard to image how would she become, right? Instead of boundless imagination, you'd better watch this Angelina Jolie 2014 Disney movie right now. As the old saying goes, all loads lead to Rome. It's the same to watching movies. Besides the traditional way to watch movies at cinema flooded in the crowd, you can have a try on other convenient ways to enjoy this 2014 Disney fantasy movie. The 1st way I want to share with you is to free download Maleficent movie in full length from the famous torrent site ThePirateBay, for it gets many popular movie downloaded in a few mins without dent in your wallet. Of course, the free stuff is usually away from perfection. If you are afraid of heavy punishment or fines due to the infriengement issue or worry about the malware, adware or some anonymous virus the torrent site might carry on, it's advisable for you to give up the movie torrent download but give it a spin with a reliable YouTube downloader. One item to note is that the network connection being unstable or sluggish might push you to the endless waiting. Comparatively speaking, the ideal way to enjoy the dark fantasy film goes to get a DVD version and make a digital copy of the movie to ISO image for burning to another black DVD disc for eternal keeping. To Copy Disney Maleficent DVD to ISO, Skirt Disney protection First! To backup the Disney disc movie, you need to remove Disney DRM copy protection with a qualified DVD decrypter since the Disney DVD is encrypted with the advanced yet complicated DRM tech to prevent its Blu ray or DVD from being illegally pirated. And the ordinary DVD rippers are willing to but powerless to render assistance, such as the world-renowned Handbrake, though with VLC player aids, but still half-crashes, fails to rip the 99-titled DVD Maleficent; and the powerful free DVD copy software DVD Shrink currently fizzles out to cope with the latest copy protection since it discontinued from the final version 3.2.0.15. In such case, to dig out an A-list DVD Shrink alternative seems the priority among priorities. A DVD decrypter able to circumvent the Disney DRM is the good tool. Grounded on this criterion, the rave-earning MacX DVD Ripper Pro cuts the buck on this point, which delivers an indefectible performance in bypassing the latest Disney X-project protection tech, let alone the common Sony ARccoS, CSS, Region Code, UOPs techs. It breaks the curse of Disney DVD indestructible protection and empowers you to copy Angelina Jolie Maleficent DVD to ISO image for playback on VLC player/Kmplayer or later burning to another DVD as forever safeguard. 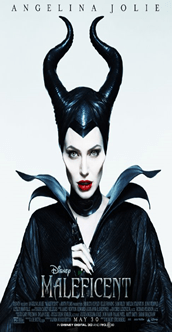 How to Intactly Copy Disney DVD Maleficent with This Remarkable DVD Copy Software? Armed with the advanced High Quality Engine and parameter settings, this DVD copy tool guarantees you to copy DVD Maleficent with 1:1 lossless quality. Step 1: Free download and launch the DVD Copy software on Mac, then click "DVD Disc" button to import DVD from your computer. If you want to copy DVD on PC, please turn to the windows version. 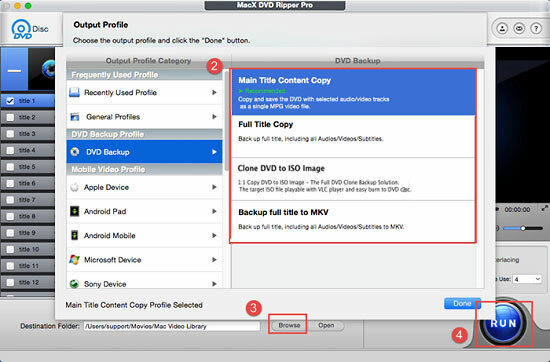 Step 2: Find "DVD Backup" from the drop-down-list and select "Clone DVD to ISO Image" mode. If you later also want to backup DVD Maleficent to a single MPEG-2 with original audio/video quality, the "Main Title Content Copy" or "Full Title Copy" can serve well for you. Step 3: Click the "Browse" button and choose the location where you would like to save your DVD backup file. Step 4:Click "RUN" to start copying DVD to ISO image with best quality. FIY: This DVD copy app considerate enough to provide more options for you with over 180 video and 14 audio formats standing by, you can rip DVDs to MP4, MOV, AVI, MKV, FLV, etc for handheld device on-the-go playback. Certainly, to free you from various parameters setting, you can also rip and directly convert Disney and Sony DVD to iPhone, iPad, Samsung, HTC, Sony devices with the optimum default settings. Knowledge Supplement: What is Disney X-project protection Protection? DRM, the abbreviation of Digital Rights Management, is a series of access control or copy protection technologies to inhibit uses of digital content that are not desired or intended by the content provider. Disney (The Walt Disney Company), a well-known DVD releaser and publisher, applies DRM for copy right protection. Accordingly, the latest protected DVD by Disney (as well as by Paramount and Warner) usually has 99 titles and the DVD movie size is larger than 40 GB, which makes it almost impossible to make DVD copy and backup. See how to remove Disney DRM.